Glass and tiling combine in this stunning hybrid entry in the Ultraframe portfolio. Contact Fox Windows for details and take our virtual reality tour to get a closer look without leaving your home. The Ultraroof is like no other tiled conservatory roof on the market. It looks stunning, is incredibly easy to install, and offers a range of exciting glass options that will help you tailor your design to suit your home. If you’re looking for a replacement tiled conservatory roof, but have also been looking at glass based systems, choose Ultraroof. You’ll be able to get the best of both worlds with this incredible hybrid offering from Ultraframe. Fox Windows works exclusively with Ultraframe – the UK’s recognised manufacturer of replacement tiled conservatory roofs – so that it can provide its customers in Kenilworth, Leamington Spa, Warwickshire and the surrounding areas with a product of the highest standard. Your new replacement tiled conservatory roof comes with a vaulted plastered ceiling. This feature will, of course, make your room warmer; but it will also allow you to add lighting throughout your new space to create a cosy room effect. Your completed orangery, conservatory or extension will feel like part of your house. Your new tiled replacement conservatory roof will need to match the themes and schemes used in your home. Fortunately, Ultraroof comes with three tile colours to help you create a stand-out design that’s truly you. Ask about our Carbon Grey, Harvest Brown and Terra Brick colour options when talking to our friendly team. The Ultraroof can be configured to suit your design requirements. Choose full-height glazing to flood the interior below with lots of space-creating sunlight or opt for Velux windows. You’ll have complete control over where and how the light falls, allowing you to create stunning focal points in your brand new room. Choose super-insulated columns to further enhance the thermal efficiency of your brand new room space. Select a fluted or flat design to suit your contemporary or traditional tastes and enjoy heat retention levels that far exceed those produced by a brick equivalent. Contact us for more information. Buy your new tiled conservatory roof from Fox Windows, knowing that it will protect you. Ultraframe has tested its Ultraroof as a fully-assembled structure. It has also been assessed and passed by Warrington Fire and met all fire rating criteria in full. Buy from us with peace of mind when you choose Ultraroof. Fox Windows can offer a choice of decorative cornices to complete the external appearance of your tiled replacement conservatory roof. A flat design is available that works with most Ultraframe systems. You can also choose a curved version that’s compatible with all of them. A choice of colours will be available to choose from. Why Buy An Ultraroof Replacement Conservatory Roof? When the time comes to sell, your Ultraframe roof will be attractive to potential buyers. The quality of the product you have purchased – which will come with a certificate of authenticity for everyone’s peace of mind – will reassure potential investors that your replacement tiled conservatory roof is built to last. Your replacement tiled conservatory roof will provide you with some much needed extra space. Instead of upgrading to a larger property in Kenilworth or the Warwickshire area, you can stay where you are and turn your conservatory, orangery or extension into a room that will be warm and comfortable. Moving can be expensive, especially when you take into account legal costs and potentially higher mortgage repayments. Our Ultraroof will be a fraction of the cost in comparison, while at the same time improving the market appeal and value of your home. A tiled conservatory roof will be a cost-effective purchase. Fox Windows specialises in installing a wide range of Ultraframe products for customers in Kenilworth, Leamington Spa and the Warwickshire area. 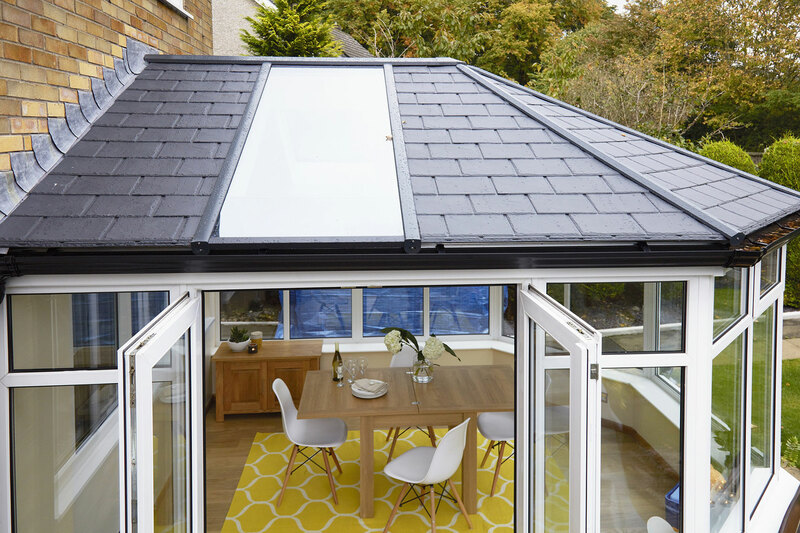 We have met the standards required by Ultraframe’s internal scheme to fit their tiled conservatory roofs and other products, and have completed numerous successful installations for our customers. Look at the Ultraroof in close up by visiting our virtual reality tool. Get an online price within just minutes. Talk to the Fox Windows team today about your design requirements. We will be able to discuss our Ultraframe range with you, which includes the Ultraroof and other market-leading replacement conservatory roofs. You can get a tiled conservatory roof quote quickly by designing your preferred product online. Within minutes you could have costs for your project. You can also use the tool for other double glazing products that we offer. Fox Windows covers Kenilworth, Leamington Spa, Warwickshire, Stratford Upon Avon, Rugby, Coventry and the surrounding areas. Use our new VR tool to explore your conservatory of choice and find out more.